The unveiling of the newly-restored Ambrose monument on "Hero's Walk". Nearly 30 years after the bust of John Wolfe Ambrose, the Irishman who helped New York become one of the greatest sea ports in the world, was stolen from his memorial, a new bust was unveiled and rededicated on May 15, the anniversary of Ambrose’s death in 1899. The event, which was attended by Ambrose’s relatives from Ireland and the U.S., local dignitaries including Parks Commissioner Mitchell J. Silver, Warrie Price; president of The Battery Conservancy, Jonathan Boulware, and Vice Consul General of Ireland Kerry O’Sullivan. Ambrose was born in Newcastle West, Limerick in 1838 and emigrated to the United States in 1851 with his family. After settling in he attended the University of the City of New York (Now NYU) where he studied mathematics. Ambrose had a brief stint in the newspaper business but soon came under the tutelage of a contractor named John Brown. His learning experiences with Brown led him to develop a more efficient street cleaning plan, he laid the first eight miles of pneumatic tubes in the United States, and was also responsible for the dredging of New York Harbor’s inner channels deepening and widening them to handle the top of the line transatlantic ships of the day leading to an economic boom that is still felt today. It was a humid and windy morning as the ceremony began with a musical prelude by piper Robert Patrick Lynch set the atmosphere, amidst the hum of the traffic along the perimeter of The Battery on the south side of State Street in lower Manhattan. Speakers, including Marian Betancourt, who wrote a piece on Ambrose last April for the magazine, talked about Ambrose’s influence on city he revolutionized, his several generations removed, niece, Linda Cruise spoke on the family’s behalf. Jonathan Zuhn, director of art and antiquities for New York City Parks, also commented on Ambrose’s immigrant past speaking to me after the service. 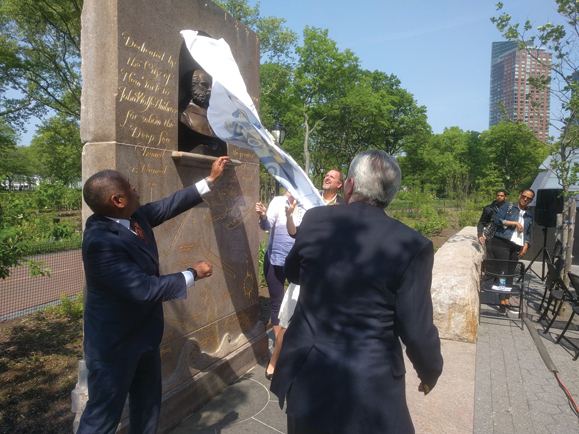 “To me the monument represents the Irish immigrant community which had an huge impact on the city of New York and how, once here, Ambrose himself had an enormous impact on his adopted city,” he said. Ambrose’s monument was restored as part of a Battery-wide refurbishment project that also saw 10 other monuments repaired and is part of a decades-long park-wide revitalization effort. The restored monuments, which also include the Giovanni da Verrazzano memorial and the statue of John Ericsson, have been relocated to the newly-christened Hero’s Walk depicting significant figures of New York City history along the perimeter of The Battery on the south side of State Street. John Ambrose was a true hero and I enjoyed writing about him in my book, Heroes of New York Harbor, and also in Irish America earlier this year.